Microsoft puts on an arm length rubber glove, reaches deep into their archive of franchises and pulls out a forgotten favorite. What could they do with it? Let’s have a look. 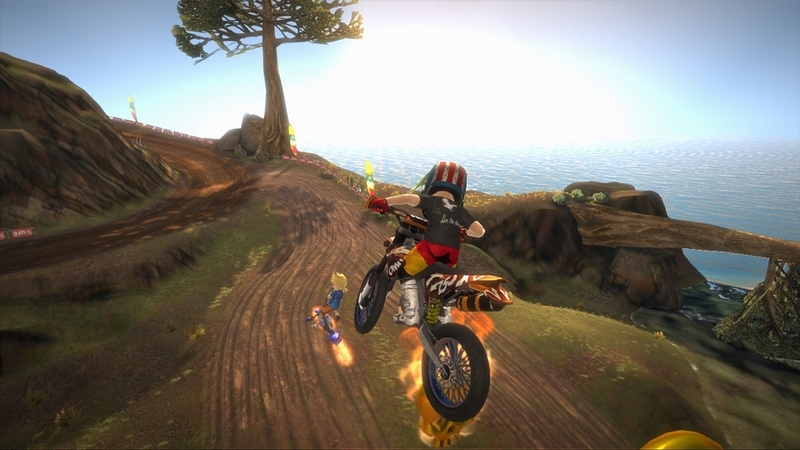 Motocross Madness is a reboot, of sorts, for a 90s PC series, of the same name. The original 2 games were difficult, but so wacky and fun to play around with I never cared much that finishing a race was nearly impossible. This game is mostly about racing around crazy tracks with multiple paths, pulling off insane tricks, and a heaping helping of avatar involved play. Let’s start with the racing. It’s similar to many non-sim racing games out there and therefore feels like a casual racer at first. It places a heavy emphasis on earning and using boost, which allows you to keep ahead of the competition. Unless you crash, of course. 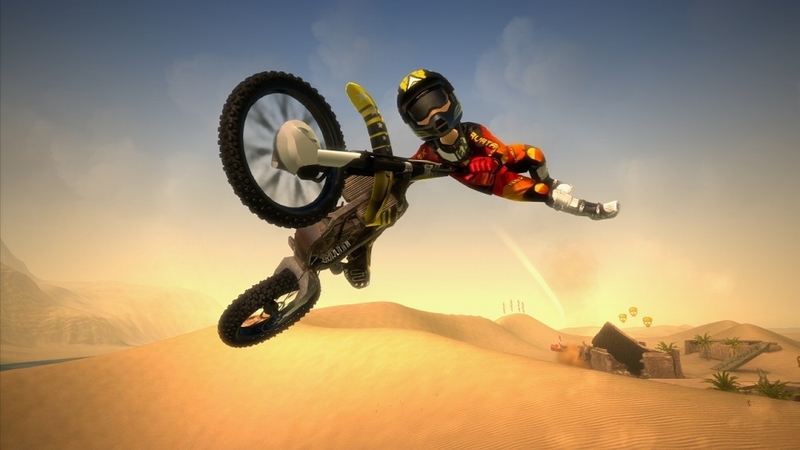 Boost is earned by doing tricks in the air, drifting on the ground, collecting pickups, etc. It doesn’t reinvent the wheel, nor does it try to. This isn’t a bad thing though, since it works. The branching paths make the somewhat small amount of levels feel more interesting, although I got lost many times in some of the later levels. At least there’s a button to reset you on the right path. It behooves you to collect coins and boosting power-ups along the way, and you’ll need to travel each of the paths as you make your laps to get them all. 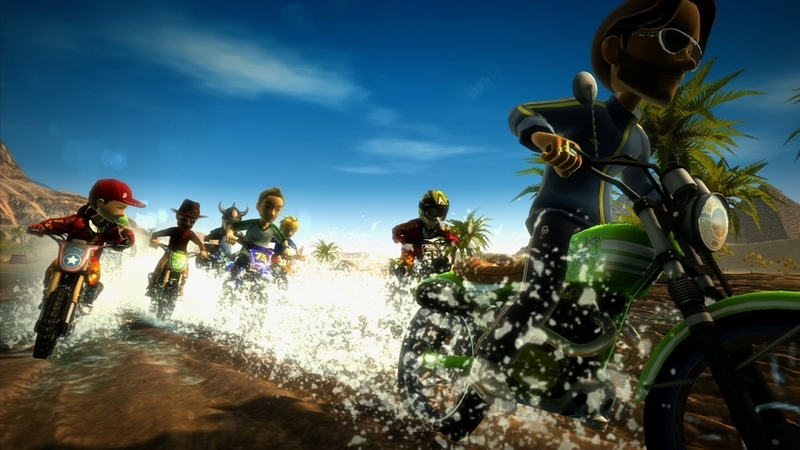 Tricks are unlocked as you level up, which you will do as you win races. There are 3 tiers of tricks. The first of which are quick and easy. The second set unlocks after a few levels and take longer to perform, earning more points/boost. The 3rd set unlocks after a few levels more, but you need to perform enough tricks in the race first to be able to pull these off. You’ll know you’re ready when you have flames around your bike like in the picture below. I hope you enjoy these tricks, as you will be doing them on every jump in the game so you can maintain boost and keep ahead of your foes. You’ll be able to tell if you land cleanly as your avatar will react negatively if you do not. The game also features Avatar Famestar, which is a cross-game program that has it’s own achievement style points and rewards. It feels more like a silly way to get you to buy the other AF games more than anything else. I paid it little mind; but for those who are Avatar crazy, enojy! There are also game types besides racing. You’ll unlock Exploration and Trick Session as you level up. Exploration allows you to drive all over the terrain, collecting coins and skulls. I found attaining the skulls to mostly be very difficult. The Trick Session is all about the highest score. It’s definitely not all good, unfortunately. I often missed floating pickups by inches, only to land off of the track because I didn’t hit the center of the ramp. I blame the controls, as I feel there’s too much oversteering. I also found myself crashing when I could see no reason why. Both in landing after a jump, and simply driving down the track. It’s way too inconsistent when you’ll hit a wall whether you’ll crash or stay on your bike. And I wasn’t pleased at all when the game hard-locked on me after finished a race in 1st place after multiple attempts. It hadn’t saved my progress yet, causing me to have to run the same race yet again. Overall, I think the game isn’t terrible, but it’s not one that I will likely return to. -Frustrating jumps that you can’t always tell what to aim for until after it’s too late. Full Disclosure: Review code for this game was provided by Microsoft’s PR firm.